Offices can be tense places. You might be surrounded by bright fluorescent lights, people talking, the noise of machinery, bosses looking over your shoulder, deadlines, or a constantly ringing phone. How can you deal with office stress? You might not be able to leave your cubicle or office. You would need to do something discreet — breaking out a massage table won’t quite cut it. You probably couldn’t even get away with kicking your feet up on the desk for a while. Fortunately, there’s an easy solution for office stress release. All you need is a tennis ball. I’m a big fan of reflexology. If you aren’t familiar with it, in simple terms you put pressure on reflex points that correspond to other parts of your body. It can be used to help you relax or even decrease pain. For example, I use hand reflexology when I get a headache or toothache. It doesn’t stop the pain entirely, but it eliminates it while the pressure is held, and it always feels a bit duller when released. 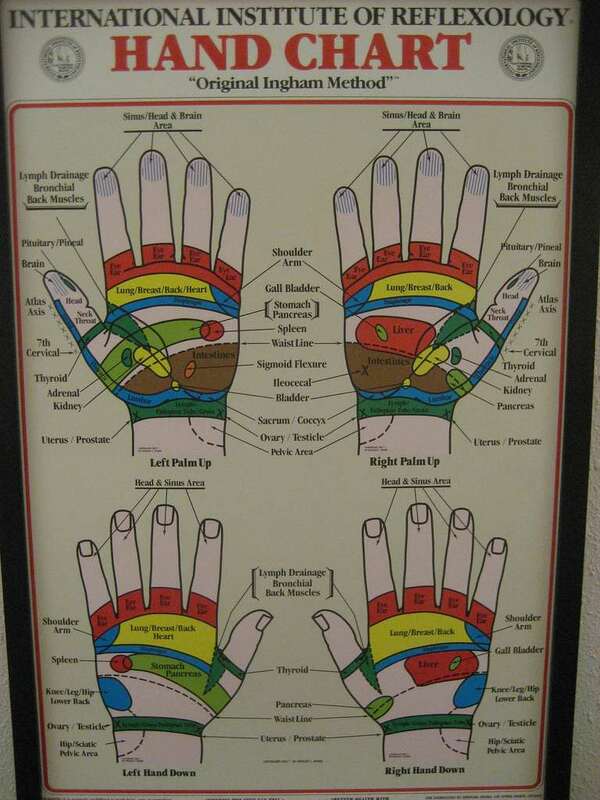 Look at the chart here to find out what areas of your hands correspond to different areas of your body in hand reflexology. While you won’t be able to target specific areas as well with a tennis ball, they can give a more general hand reflexology massage to relieve overall tension from office stress. It’s very easy to do. Just take a tennis ball and roll it between your hands. You can roll it between your palms or you can use one hand to gently roll the tennis ball over the outside of the other hand. When to do it: This simple massage can be done any time your hands aren’t otherwise occupied and when it won’t cause a distraction to others (like in a meeting). It’s a great activity to do while you’re on the phone or listening to messages. If you only have one hand free, you can even roll the tennis ball between your free hand and your desk instead. Squeeze a tennis ball in your hand to relieve office stress. You’ve probably seen stress balls, a popular office stress relief tool. They’re sometimes filled with sand or more of a gel-like substance and the outer material is often rubbery. People seem to love them. However, they’re not always easy to find when you want to buy one, they can be more expensive than other options, they can break and make a mess, and they’re easy to lose. A tennis ball is a natural alternative. They’re firmer, but not as firm as other sports balls, and they have a “warmer” comfortable feel due to the cloth-like texture. They’re also abundant (you can easily buy them in bulk), and they’re very inexpensive. To use a tennis ball as a makeshift stress ball to relieve office stress, just pick up one and give it a squeeze. It couldn’t be any easier than that! When to do it: Your tennis ball stress ball is another ideal office stress relief tactic when you’re on the telephone. Because a tennis ball is relatively firm, they’re great for getting out some aggression too. To do that, squeeze the tennis ball as hard as you can, and hold it that way for a few seconds. You can use this stress relief tactic discreetly by holding the tennis ball under your desk. Is there anything quite as relaxing as a good foot massage? For me, it’s one of the best ways to relax when I’m feeling tense, especially if I’m carrying that tension in my muscles. But giving yourself a foot massage in the office isn’t generally feasible. Throw constricting office footwear into the mix, and your feet could probably use a break. No worries. Pull out that trusted tennis ball (or two) and give yourself a rolling foot massage hands-free! Just roll your feet back and forth over the tennis ball, gently or firmly (doing whatever feels comfortable for you). If you find a tender spot on your foot (such as your plantar fascia — the tissue that creates the arch in your foot), you can stop rolling and put some direct and steady pressure there for a few extra seconds. A tennis ball foot massage might sound simple, but it feels amazing. I do this daily and wholeheartedly recommend it! I find this gives me a deeper muscle massage in the feet than even a professional has (and it was a physical therapist who turned me onto this trick when my plantar fascia was tense after being in a walking cast for weeks). Here’s a tip for you: If you find a regular tennis ball to be too flexible for a good foot massage, visit your local pet store. You’ll often find tennis balls meant for dogs, and they can be firmer. You also might be able to find different sizes there. While designed for athletes, the video below gives you some great methods for using a tennis ball to massage your feet. You can do these exercises while sitting, making them ideal for the office. The video is from Rich Poley, author of Self-Massage for Athletes. When to do it: You can give yourself a tennis ball foot massage to relieve office stress any time you can kick off your shoes under your desk (generally when you’re alone). I find it’s most effective when standing, but that isn’t possible in most work environments. It still works quite well while sitting at your desk. All of these office stress relief tips are extremely simple, and very affordable. For no more than a few dollars you can ease muscle tension and calm your nerves. You’ll be the envy of your office when your coworkers see how relaxed and composed you are. Keep it your little secret or spread the word — the choice is yours. But now is the perfect time to get started. A happy worker is a productive worker, and who knew all it would take was a little tennis ball to brighten your work day? Aside in tennis ball for relieving stress, Kava also can help you in relieving stress.The abilities of drinking kava improves your mental alertness,and helps you think more clearly.Enjoy drinking kava and see the result.